Breakfast is such a great meal, one that can be enjoyed safe in the knowledge that you still have two more meals to look forward to. No matter what you choose you’ll probably still be within your recommended calorie intake for the day, it really is the meal that holds the most potential. Whether you choose a savoury dish or something a little sweeter there’s so many options, I definitely think it’s my favourite meal of the day. 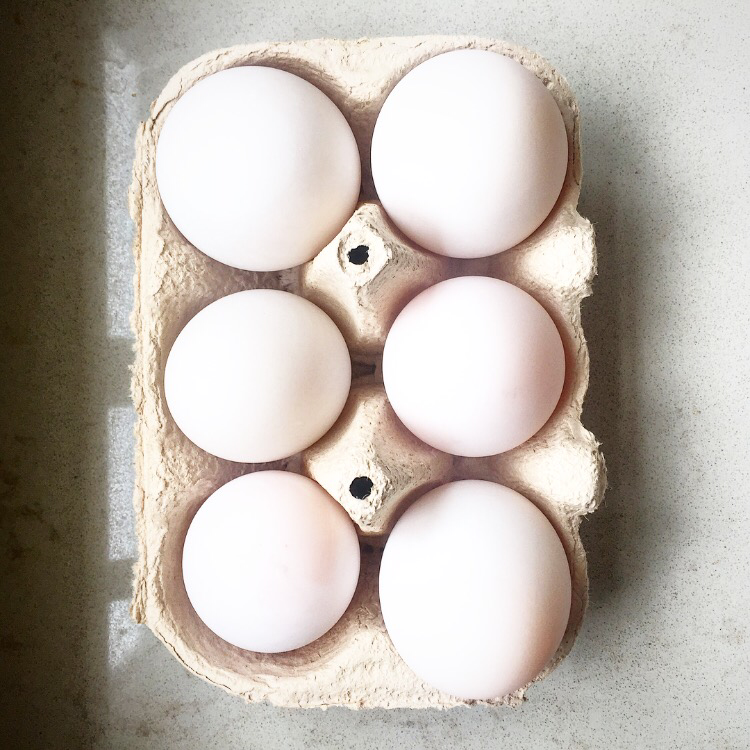 During the week I tend to opt for something quite healthy; homemade granola, eggs and chicken sausages or some multigrain porridge always go down well. However at the weekend when I have more time and I want to treat myself I’ll make my homemade sausage, bacon and egg muffins. 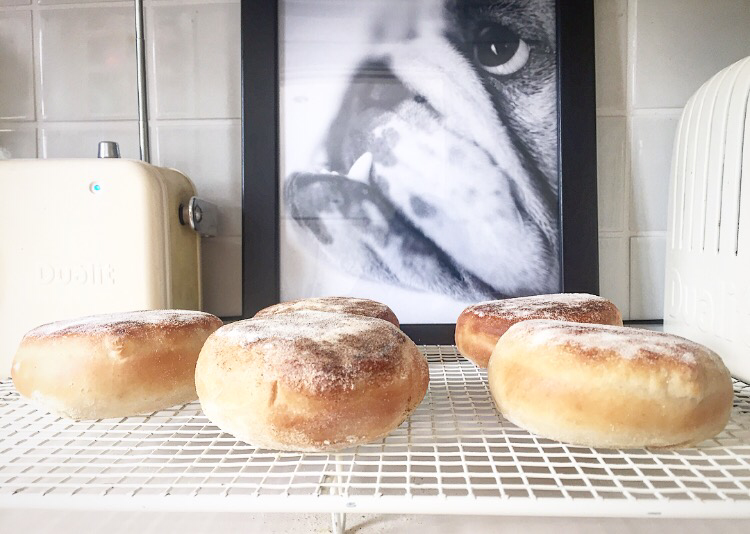 They have to be my favourite breakfast, in fact I’m getting hungry just writing about them. They’re reminiscent of the McMuffin but without the pressure of trying to get to McDonalds before 10.30! 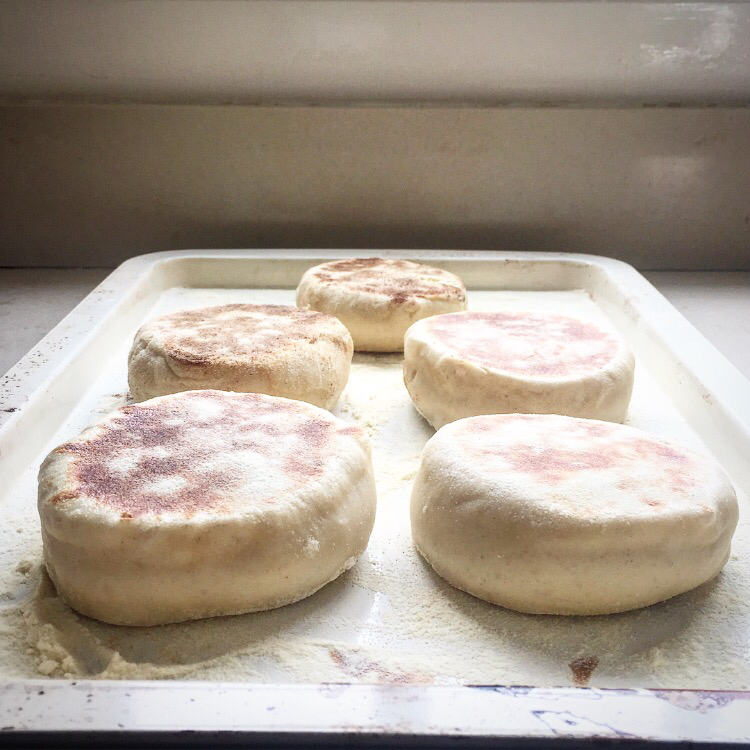 This recipe gives you the method for making your own English muffins but If you prefer you could buy them ready made. If you’ve never had a go at making your own before I urge you to give them a go. 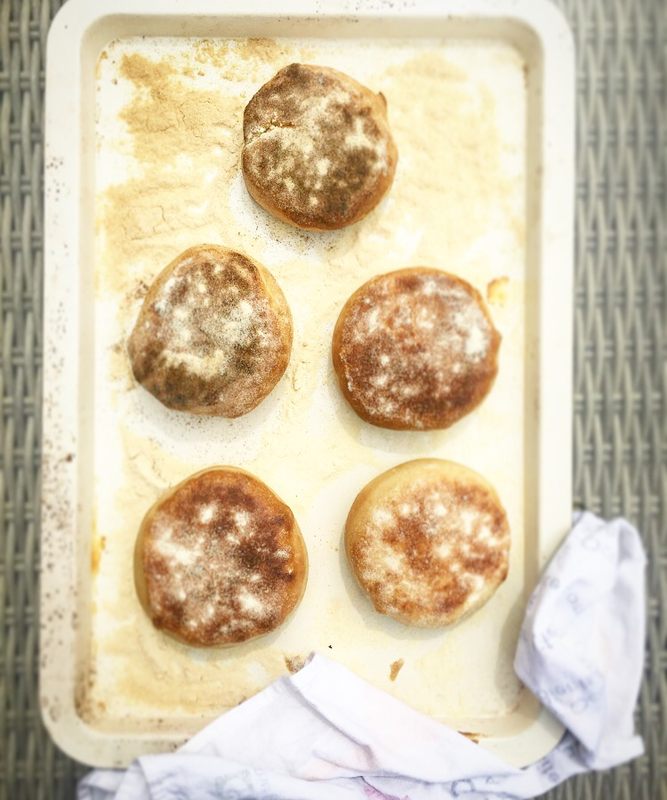 You cut them out with a pastry cutter rather than having to shape them, making them an excellent bake for a beginner. I make a batch and then keep two or three in the freezer ready for lazy weekend brunches. All that’s left for you is to decide on the ultimate divider of options, ketchup or brown sauce? Happy baking and eating. 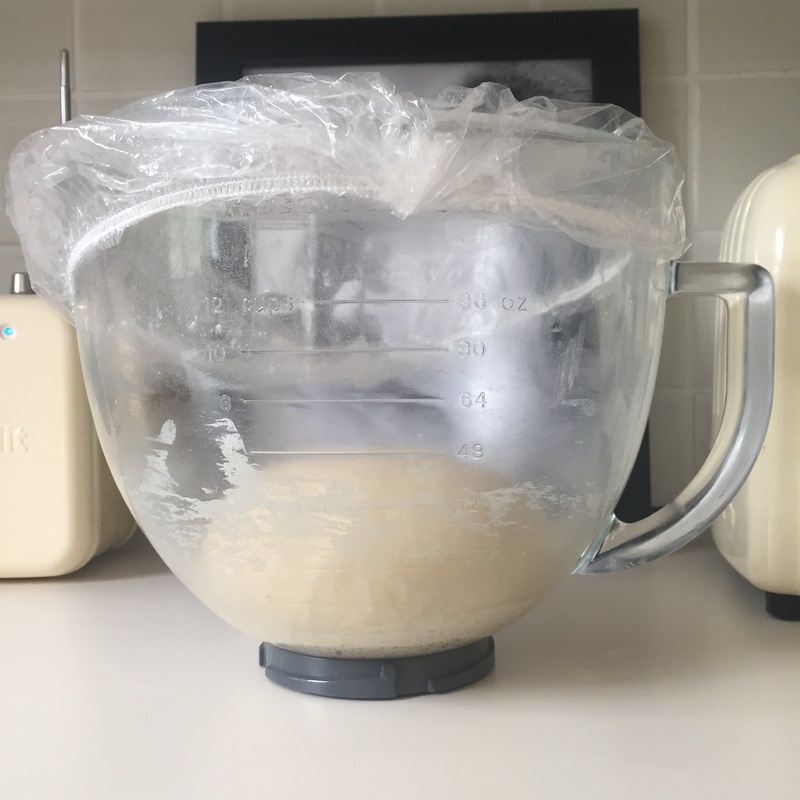 In a food processor with a dough hook or mixing bowl combine all the muffin ingredients (apart from the polenta and milk.) 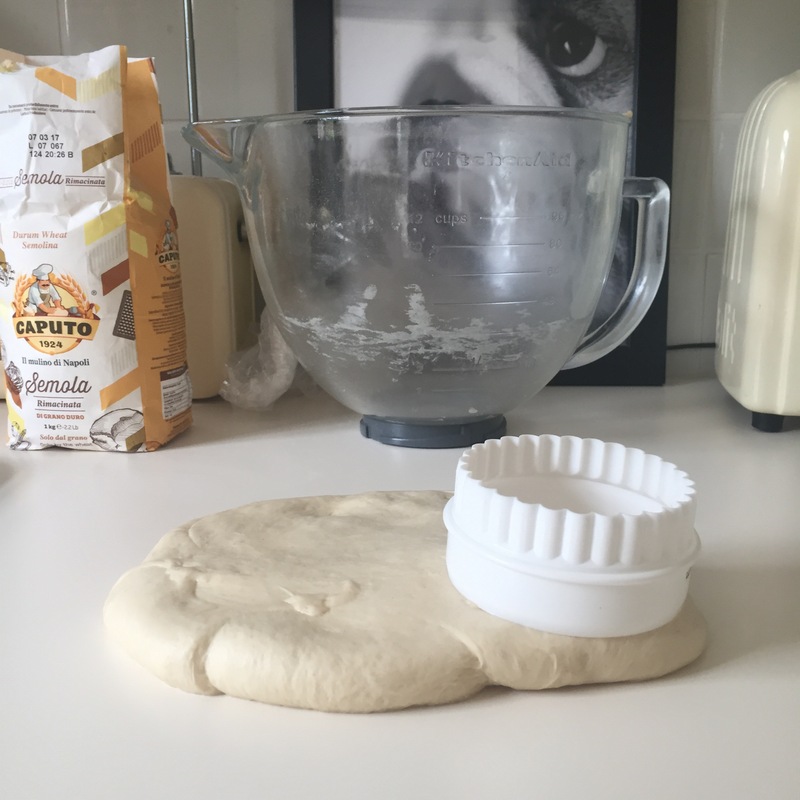 Add the milk, with the machine running, you want a firm dough that’s not too sticky, but with no dry patches. You might not need all the milk, I used about 210ml. 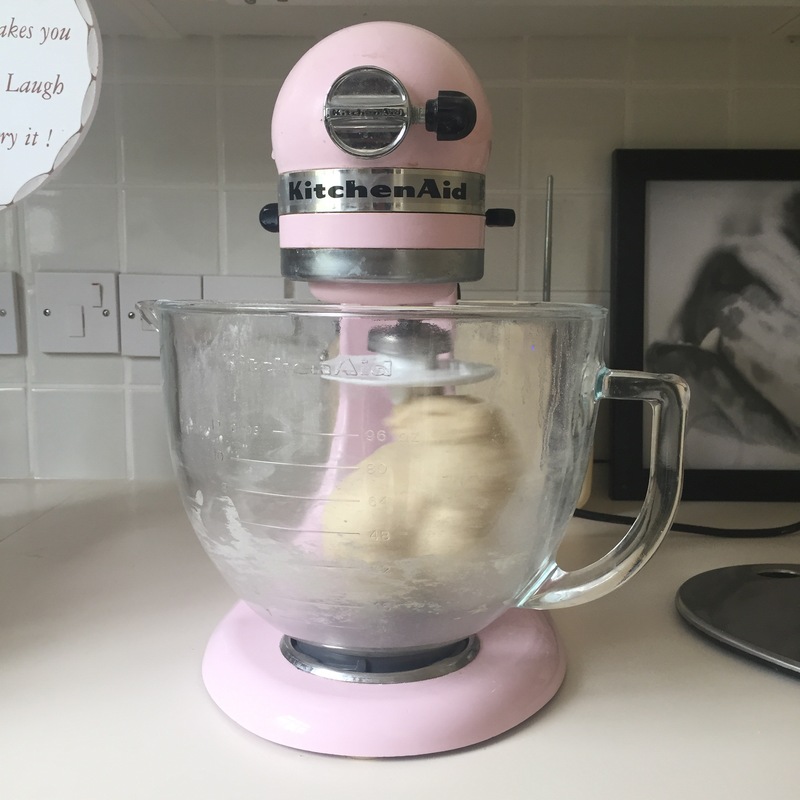 Knead by hand for 10 mins or by machine for 5-8 until the dough looks smooth, shiny and springs back when pressed. Place into an oiled bowl, cover with oiled cling film and leave to rise in a warm place until doubled in size (about 1 hour 30). Remove and roll out on a lightly oiled surface until about 2cm thick. 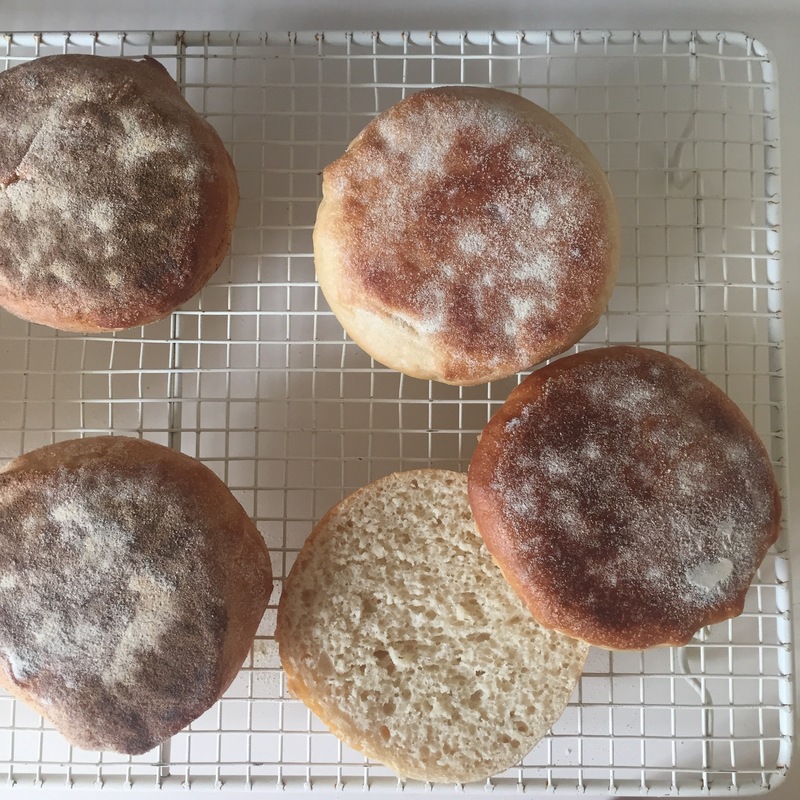 Cut out 5 muffins using a 7-8cm circle cutter and place on a tray lined with polenta. Dust the tops with polenta. You can re roll the trimmings too but these don’t look as good as the first roll. Cover again with oiled cling film and leave to prove until doubled in size. About another hour or so. Heat oven to 220C/200C fan oven. Heat a large non-stick frying pan on a medium high heat. Brown the muffins for a min or so on each side then put back on the tray, Bake for 12-15 mins, with a roasting tray of water on the bottom to create steam, until golden and risen and firm to the touch. Cool on a wire rack. Squeeze the meat out of the sausage skins and shape into burger shapes. 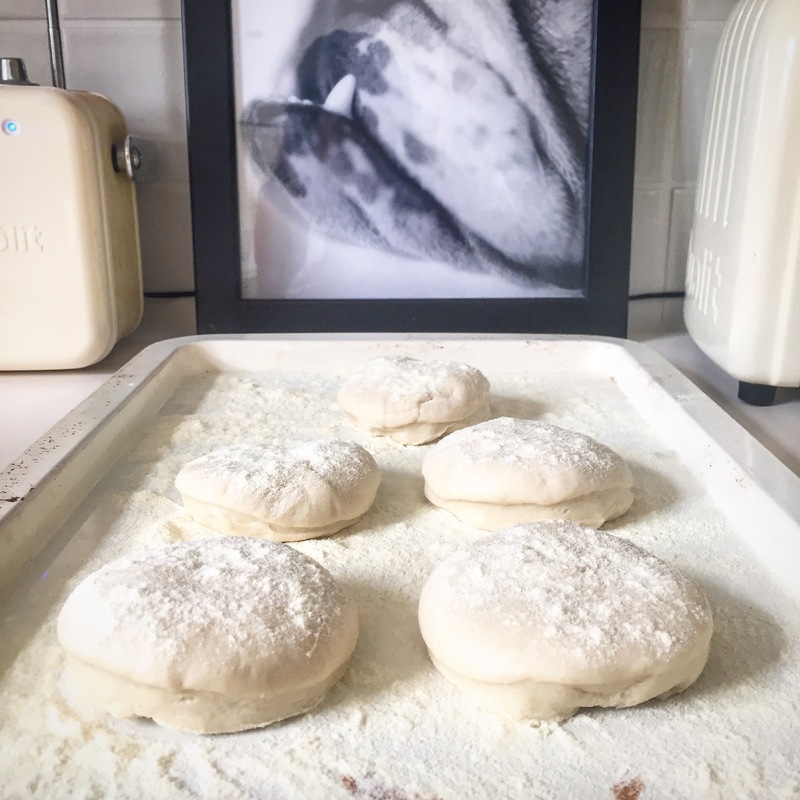 Dust in seasoned flour. Grill along with the bacon until crispy. 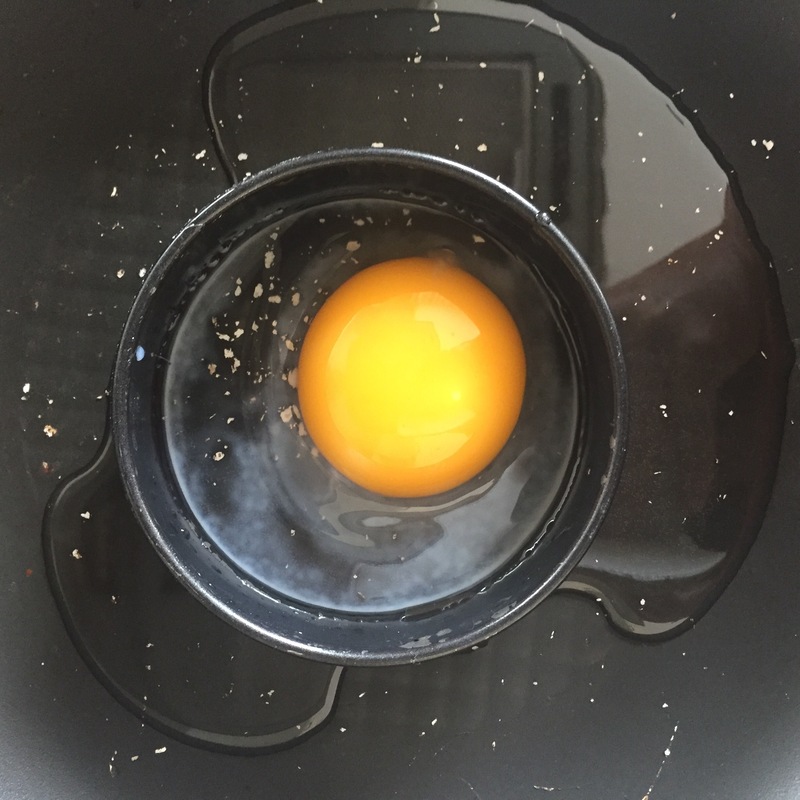 Either fry or poach you eggs until cooked to your liking, if you fry them use an oiled ring to get them perfectly circular. 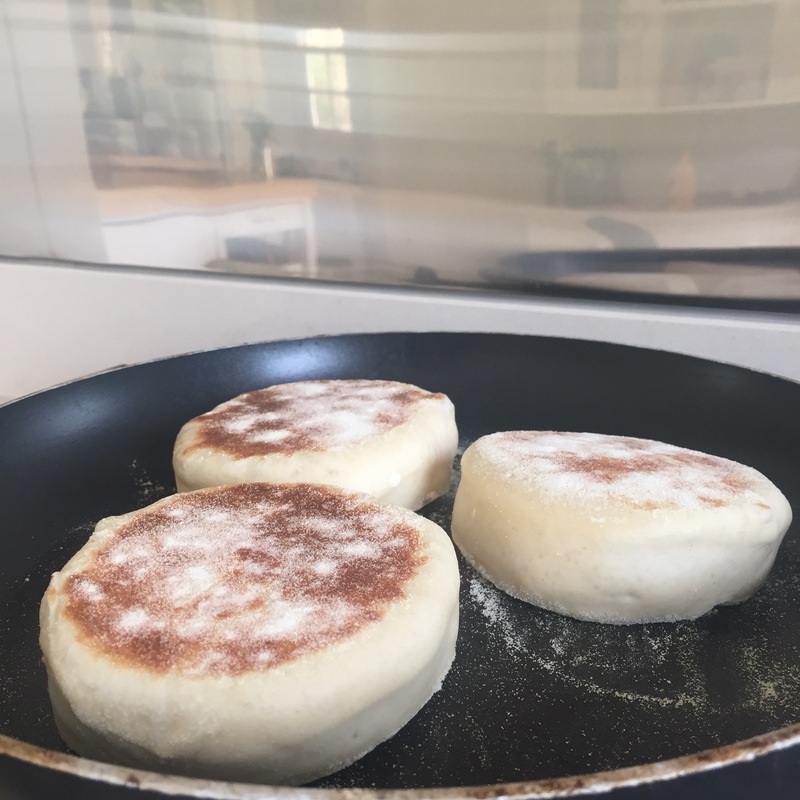 Lightly toast muffins on each side under the grill and butter if you like. Put the cheese slices on the base and grill for a few more seconds until starting to melt. 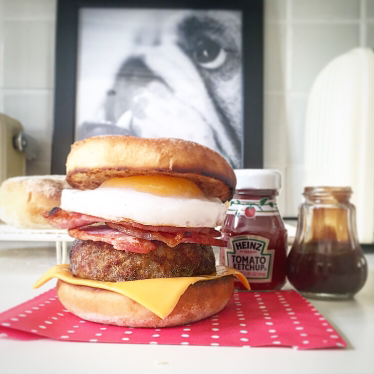 Top with bacon, a sausage pattie and your egg.